Individual and group counseling for victims of abuse. While individual counseling is aimed at dealing with a specific client’s case; group counseling is aimed at encouraging victims to see themselves as survivors and gather strength from the experiences of each other. While individual counseling occurs when cases are reported; group counseling takes place quarterly. Bi-annual Survivors Forum. This happens twice a year, during which a motivational speaker on a particular issue of relevance to the survivors, is invited to speak to them. This forum, offers a close supportive environment for women and girls who had been or are presently victims of one form of violence or the other to share their experiences and make positive choices that would help break the feeling of hopelessness brought about by the violence they had experienced or are still experiencing. The speakers structure their talk around the processes of coping with hurts, depression, separation and divorce, health and wellness; self-esteem; post traumatic stress disorder; and other losses which are consequences of violence against women and girls. Referral Services. We refer clients to hospitals, police stations, and government agencies such as the Ministries of Women Affairs, Justice, Social Welfare Department etc as the need may be. Our lawyers sometimes accompany abused women to the police station to provide support and professional assistance to them, when reporting their cases. This often helps in ensuring that the women do not suffer secondary victimization (blaming and ridiculing) at the hands of our law enforcement agents. Our trained lawyers provide alternative dispute resolution strategies such as mediation to try and resolve the conflict between couples, and in families, especially when criminal acts such as physical assaults occasioning harm, defilement and other forms of sexual abuse, have not taken place. This is because for most female victims of domestic violence in Nigeria, what they want is the violence (verbal, physical, emotional and psychological) to stop and not necessarily their marriages to end. Our trained lawyers are available to litigate cases of violation of women’s human rights. They do so in civil matters; and also hold watching briefs in criminal cases, where the state prosecutes. Our shelter project, known as Sophia’s Place is the first battered women’s shelter in Nigeria. Set up in May 2001, it is home away from home, and located in a suburb of Lagos (the location of which cannot be made public due to the nature of cases received). A resident Shelter Administrator, sees to the day to day running of the shelter, responds to the needs of the residents; and reports back to the office. Full capacity, the shelter can admit six (6) families or 12 individual women. Shelter stay is for one month and during this period, it is free. Thereafter if a resident wants to extend her stay, either she or the referring organization or individual, would have to pay a stipend monthly. Till date, the shelter has accommodated over 1000 individual women, young girls and children. 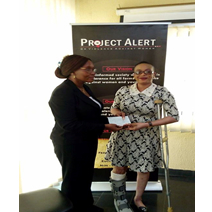 In cases where a female victim of violence obtained severe injuries and is need of funds to enable her access medical care, Project Alert does assist by helping to raise funds from members of the public to assist the victim. This is very important because in most cases of violence against women, resulting in injuries, the public often clamour (and rightly so) for the arrest and prosecution of the perpetrator. However very few people pay attention to the medical needs of the victim and the fact that she may not even have the funds to access treatment, even in a government owned hospital. 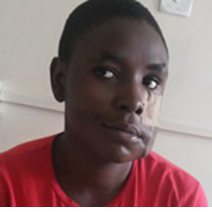 Blessing Isanbor was 19 years old in 2012, when she was shot in the face by her junior sister’s boyfriend Emmanuel Otujo ( then a corporal in the Nigerian Police Force) in Lagos. Otujo ran away with Blessing’s sister after committing the dastardly act and for three weeks there as a man hunt for him. He was eventually arrested , dismissed from the police force and charged to court. Blessing needed money for the series of surgeries she needed. Project Alert with the support of it celebrity Ambassador, Kate Henshaw, raised some funds to assist her. Mercy Nnadi a 36-year-old was burnt by her husband with hot pressing iron, over allegation that she was having a clandestine relationship with his father. While the husband was arrested and prosecuted, Mercy almost died in hospital as the doctors were threatening to discontinue treatment because of lack of funds. 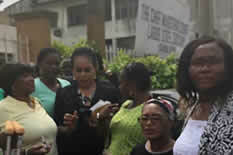 Project Alert was able to get the Lagos State Ministry of Women Affairs to pay her hospital bills. Project Alert was also able to raise funds to secure accommodation for her. 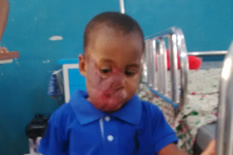 Michael Alvez, a child with an infected facial haemangioma was found on the street of Lagos by Project Alert celebrity Ambassdor, Kate Henshaw, being used by his mother to beg for alms. Kate rescued both mother and baby from the streets and got them admitted into Lagos University Teaching Hospital, LUTH. Then together with Project Alert, funds were raised for his treatment. Recognizing that economic dependency is one major reason why women stay on in abusive relationship, the skills acquisition project of Project Alert is aimed at empowering women economically to enable them break the circle of violence in their lives. Skills acquisition programmes are organized bi-annually for survivors in various areas such as bead making, small chops, hat making, embellishment, liquid soap making; and make over. Project Alert gives soft loans to women and families, who need some assistance to either enable them rent a new place away from the abusive environment or start a small business. Project Alert provides accommodation support to victim’s family. 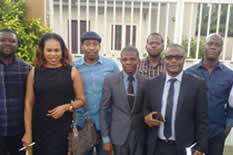 Mr. Okechukwu Okiki a father of a 3 year child who was sexually abused by a neighbour ran to Project Alert for help. Though he reported the matter to the police promptly, the police tried forcing a out of court settlement with him, which he refused. Project Alert took up his matter, accompanied him to the police station; provided him free legal aid; and gave him a loan to rent a new accommodation away from the area the incident had happened. The perpetrator was arrested, prosecuted and jailed. Mr. Okiki started a new life in his new home, with his family. 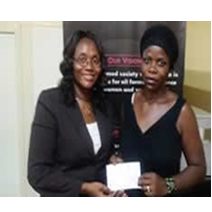 Ivie Edobor receiving a cheque to help her pay for her new accommodation. 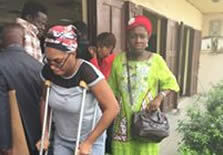 Ivie Edobor was attacked by her husband, whom she had been separated from for two years. He stalked her and laid ambushed for her one night, and attacked her outside her home. He broke her right leg and almost killed her. Project Alert is supporting Ivie all round, as we are holding watching brief on the criminal case against her husband; representing her in the divorce suit; and assisting her get on her feet. Mrs. Endurance Oguzie a survivor of domestic violence and sexual abuse of her seven year old daughter by their husband and father respectively. She stood up against her husband and his family and sort help and justice for herself and her daughter. Project Alert provided both legal aid and financial support to Endurance. The husband was arrested, prosecuted and jailed; while we supported her with money to enable her start a business that would help feed and care for her four (4) children. 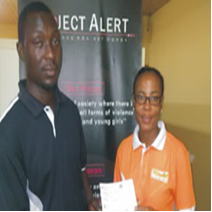 Project Alert gave her a cheque to help start a foodstuff business. Project Alert donated a Butterfly sewing machine to Precious Damilola Sonubi, based in Abeokuta. Precious is learning how to sew and needed a sewing machine to help her start her sewing business. She solicited help on Greenland Assistance Haven, a cyber group that renders help to single and abused women, and Project Alert responded.